Farming uses copious amounts of water–70 percent of all freshwater consumed is used for agriculture, according to the U.S. Geological Survey, only about half of which can be recycled after using. It also requires huge swaths of land and, of course, just the right amount of sun. AeroFarms thinks it has a better solution. The company’s farming method requires no soil, no sunlight, and very little water. It all takes place indoors, often in an old warehouse, meaning in theory that any location could become a fertile growing ground despite its climate. The startup is the brainchild of Ed Harwood, a professor at Cornell University’s agriculture school. In 2003, Harwood invented a new system for growing plants in a cloth material he created. There’s no dirt necessary–beneath the cloth, the plants’ roots are sprayed with nutrient-rich mist. Harwood received a patent for his invention and founded Aero Farm Systems, so named because “aeroponics” refers to the method of growing plants without placing them in soil or water. The company, which sold plant-growing systems, was mostly a side project for Harwood and didn’t generate much revenue. In 2011, David Rosenberg, founder of waterproof concrete company Hycrete, and Marc Oshima, a longtime marketer in the food and restaurant industries, looked at the inefficiency of traditional farming and sensed an opportunity. The pair began exploring potential new methods and, in the process, came across Aero Farm Systems. They liked what Harwood had developed–so much that they offered him a cash infusion in exchange for letting them come on board as co-founders. They also proposed a change in business model: Rosenberg and Oshima saw a bigger opportunity in optimizing the growing process and selling the crops themselves. Harwood agreed. The company became AeroFarms, with the three serving as co-founders. The trio bought old facilities in New Jersey–a steel mill, a club, a paintball center–and started converting them into indoor farms. Today, each of the startup’s farms features vertically stacked trays where the company grows carrots, cucumbers, potatoes, and, its main product high-end baby greens, which it sells to grocers on the East Coast including Whole Foods, ShopRite, and Fresh Direct, as well as to dining halls at businesses like Goldman Sachs and The New York Times. By growing locally year-round, the company hopes it will be able to provide fresher produce at a lower price point, since transportation will be kept to a minimum. (Currently, about 90 percent of the leafy greens consumed in the U.S. between November and March come from the Southwest, according to Bloomberg.) AeroFarms collects hundreds of thousands of data points at each of its facilities, which allows it to easily alter its LED lighting to control for taste, texture, color, and nutrition, Oshima says. The data also helps the company adjust variables like temperature and humidity to optimize its crop yields. The result, according to AeroFarms, is wild efficiency: The growing method is 130 times more productive per square foot annually than a field farm, from a crop-yield perspective. An AeroFarm uses 95 percent less water than a field farm, 40 percent less fertilizer than traditional farming, and no pesticides. Crops that usually take 30 to 45 days to grow, like the leafy gourmet greens that make up most of the company’s output, take as little as 12. Oshima claims that its newest farm, which opened in Newark in May, will be the world’s most productive indoor farm by output once it reaches full capacity. 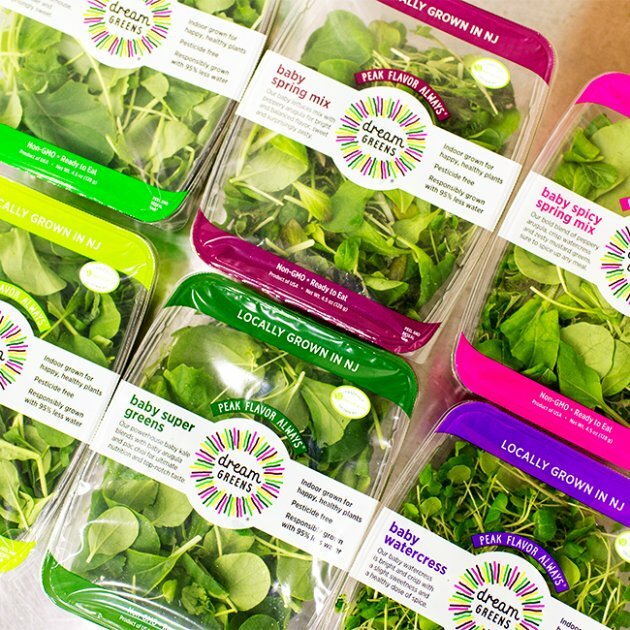 Currently, AeroFarms’ greens retail for around the same price as similar gourmet baby greens. To be sure, as innovative as AeroFarms might be, it’s not exactly a practical solution for replacing the world’s farms. One big problem is that indoor farming requires huge amounts of electricity, which is not only costly but also offsets much of the good done by preserving water because of the large carbon footprint it creates. AeroFarms acknowledges the drawback but says that it’s working to address the problem. The company hired Roger Buelow, the former chief technology officer of LED lighting company Energy Focus, who helped design AeroFarms’ customized LED lighting system. “That allows us to be much more energy efficient than anything else out there,” Oshima says. That steep learning curve, he says, can create obstacles for companies in this industry. “The biggest issue is finding people who are qualified,” he says. “Growers in particular are very hard to find. Who’s training them? The answer is, very few places.” In the U.S., the University of Arizona, University of California, Davis, and the University of Michigan are among the few institutions that offer courses in vertical farming. At AeroFarms, that issue is magnified thanks to Harwood’s patented growing medium. “No one has direct experience with this,” Oshima says. Once the startup finds candidates it trusts to learn the growing process, it has to train them and teach them the company’s more than 100 best operating procedures. The company employs 120 people. It has raised more than $100 million to date, from firms including Goldman Sachs and GSR Ventures. Other companies, like Michigan-based Green Spirit Farms and California-based Urban Produce, also sell to consumers using vertical farming methods, though TheNew Yorker reported in January that AeroFarms had twice the funding of any other indoor farming company–even before its recent $34 million round. AeroFarms sees its growing method as especially useful in areas where the climate might not be friendly to growing, or where water or land is sparse. The startup currently has nine farms, including locations in Saudi Arabia and China. It plans to reach 25 farms within five years.